Today we review Bestvite Coleus Forskohlii. 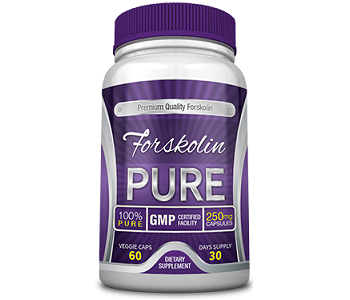 This formula contains 20% forskolin extract, the best extract to help you lose weight. Not only will this supplement help promote a better metabolism, but it will promote lean muscle building, so the weight you lose will be from fat and not muscle. 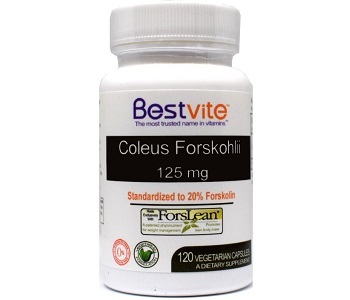 Each capsule contains 125 mg of 20% forskolin extract. This is half of the amount per capsule when compared to its competitors. This supplement is free of dairy, eggs, soy, and wheat, as well as being free of any preservatives. It also comes in a vegetarian capsule which makes this supplement easy to take for more people. The manufacturer recommended daily dose for this product is to take two capsules, twice daily. Each dose should be taken 20-30 minutes before eating a large meal. While taking 4 capsules daily will get you to the recommended 500 mg of forskolin extract per day, you are taking twice the amount of pills than other similar supplements. While no official side effects are listed on the website, some customer reviews did mention that this supplement increased the number of bowel movements they took in a day. Increased bowel movements could lead to dehydration, so it is important that you drink enough water throughout the day while using this supplement. The manufacturer’s suggested retail price for this supplement is $79.98 for a 120 count bottle, or a one month supply. Currently, they have it on sale through their website for only $19.99. Such a drastic difference between the suggested price and the actual selling price shows a huge inflation and that the company is just trying to make it seem like you are getting a better deal. They do have some additional bulk discounts, but they still do not take that much off of the purchase price. Buying two bottles together brings the per bottle cost down to only $19.49, and buying six bottles together brings the price to only $18.33, which will only save you $10 off of the total price. The company does offer a 60 day money back guarantee. Should you be dissatisfied with this supplement within two months of your purchase, you can return your items for a refund. The website claims you must follow their Returns and Refund process to print off a shipping label for your return, but we were unable to find any actual information about this process or how to start the process. Additionally, you can only return unopened and unused products for a refund. That means, you are unable to actually try this supplement to see whether it will be effective before making up you mind whether or not you like this product. There are a few things we liked about this supplement. The formula includes 20% forskolin extract, which is the optimal extract for weight loss. Also, with a vegetarian capsule and no preservatives and additives, this supplement is great for almost anyone. Unfortunately, we had many concerns regarding this product. In order to get the optimal dose of this extract, you need to take 4 pills per day, which is double when compared to its competitors. Also, the huge gap between the suggested retail price and the actual purchase price on the company’s website shows they are just trying to inflate the price of their product to ensure you buy it from them. Lastly, their guarantee is not good. You must follow their strict procedure which they have no information listed, and you are only able to return unopened packages. With these concerns, we are unable to recommend this supplement to help you reach your weight loss goals.